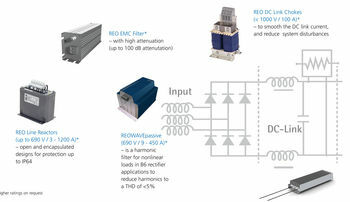 REO is taking the opportunity at the Drives and Controls exhibition to present its range of Drive peripheral components, known as REO Unity. This comprehensive range provides Drive manufacturers and integrators alike with a single source for EMC components, like RFI Filters and Input chokes, as well as performance enhancing products like output chokes and sinewave filters. In addition there is a comprehensive range of braking resistors. Unique to REO is the capability to present all components in high ingress protection versions, for example IP64, but also in force air-cooled and even water cooled versions. REO provide application assistance to help customers select the correct part and even provide an EMC testing service for individual products to help customers satisfy compliance issues. REO have a wide customer base in the drives sector, from HVAC to Drives used in renewable applications. They have a good understanding of what is required from a technical point of view but what specific applications demand too.